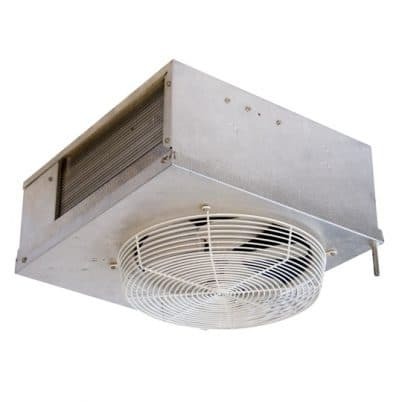 The Dual-Air Quiet (DQ) Systems are designed to provide refrigerated air to 55–65°F. DQ evaporators return air at the bottom and supply two-way air discharge 10–12 feet in both directions at a medium velocity airflow. This promotes fantastic circulation in long and narrow display cases. DQ evaporators are available in standard capacities from 1,800 to 4,600 BTU per hour and are used with an R134a refrigerant. Pump-down solenoid valve (standard) protects compressor in the event of leaks. Our Application Engineers can help you design the system you need. Call us today at (323) 578-3330 and we’ll help you get the right product for your project. Excessive number of turns will cause refrigerant flow problems. This could cause early compressor failure. Suction line accumulators are recommended. Required if working lower than the normal 55-65° operating range from wine cellar. Drain line must always flow downhill to drain or pump. The system is controlled by a pump down control system. There is no control wiring between thermostat and condensing unit. Keep line sets as short as possible. Excessive number of turns will cause refrigerant flow problems. This could cause early compressor failure. Suction line accumulators are recommended, and required if working lower than the normal 55-65° operating range from wine cellar. The system is controlled by a pump down control system. There is no control wiring between thermostat and condensing unit.